Here is a recreation of my prize-winning submission for the design competition Public Space in the New American City, held in Atlanta, Georgia in 1994. 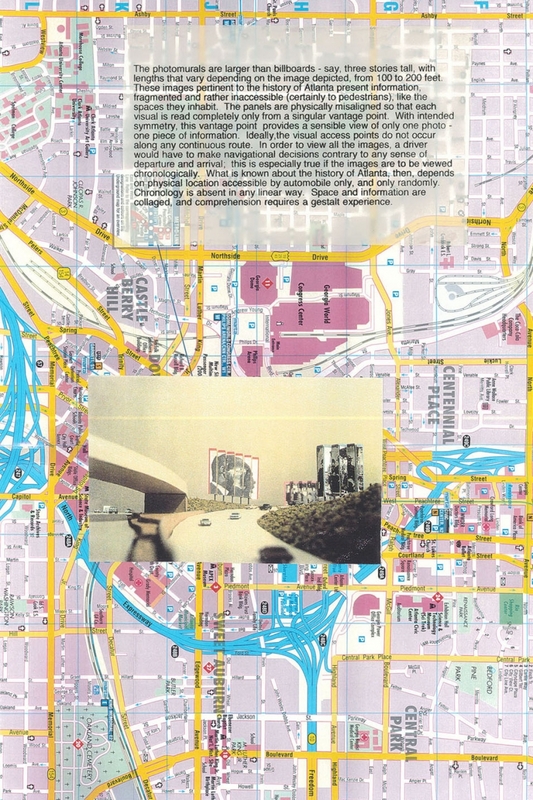 The original entry for site C comprised a site model and boards, which no longer exist. 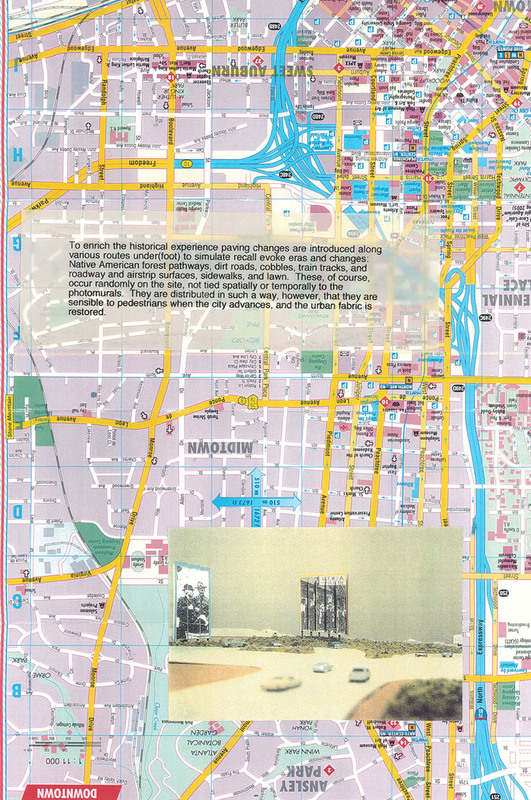 I’ve included here photos of the model, a site map, and explanatory text from the boards. One story that can be told of any city is that of its growth, through the lenses of transportation and information flow. Atlanta by example, developed as a place at a crossroads, a nexus for travel, exchange of goods and of information. These impeti reinforced each other, and stimulated further growth and connections, at larger and larger scales until the smallest most local scale is lost: pedestrian movement. Can we imagine a future city, reclaimed by pedestrians, where electronic information flow is maximized, and the movement of goods and people by roadway is consequently minimized – where vehicular travel is unnecessary and obsolete? Permanent photomural sculptures are to be installed on islands adjacent to on-off ramps in an American city, whose urban fabric has been destroyed or eroded by the building of state and interstate highways, in such a way as to make pedestrian movement difficult, unpleasant, insensible, or impossible. As a way to emphasize the spatial disintegration of place, the narrative told with the photomurals is primarily sequential, linear, and chronological, as in the history of the city, or even the history of the neighborhood impacted by the encroaching roadways. Atlanta is used as the example here. The photomurals are larger than billboards – say, three stories tall, with lengths that vary depending on the image depicted, from 100 to 200 feet. 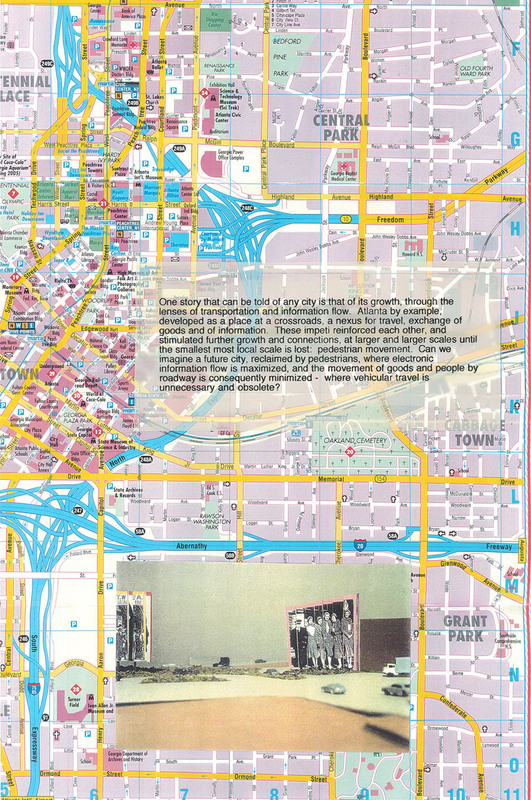 These images pertinent to the history of Atlanta present information, fragmented and rather inaccessible (certainly to pedestrians), like the spaces they inhabit. The panels are physically misaligned so that each visual is read completely only from a singular vantage point. With intended symmetry, this vantage point provides a sensible view of only one photo – one piece of information. Ideally,the visual access points do not occur along any continuous route. In order to view all the images, a driver would have to make navigational decisions contrary to any sense of departure and arrival; this is especially true if the images are to be viewed chronologically. 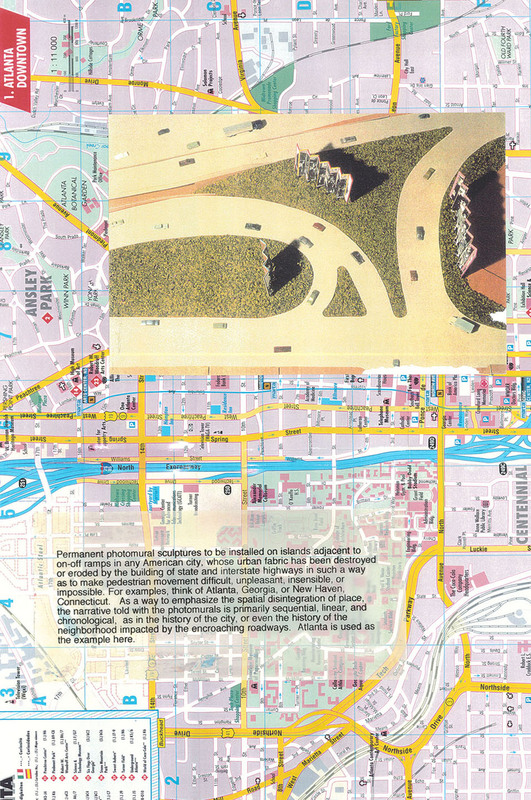 What is known about the history of Atlanta, then, depends on physical location accessible by automobile only, and only randomly. Chronology is absent in any linear way. Space and information are collaged, and comprehension requires a gestalt experience. To enrich the historical experience paving changes are introduced along various routes to simulate recall evoke eras and changes: Native American forest pathways, dirt roads, cobbles, train tracks, and roadway and airstrip surfaces, sidewalks, and lawn. These, of course, occur randomly on the site, not tied spatially or temporally to the photomurals. They are distributed in such a way, however, that they are sensible to pedestrians when the city retreats, and the urban fabric is restored.